Capucine Penicaud, Program Manager for the International Coalition to Eliminate HBV (ICE-HBV), recently attended the International Liver Congress in Vienna. 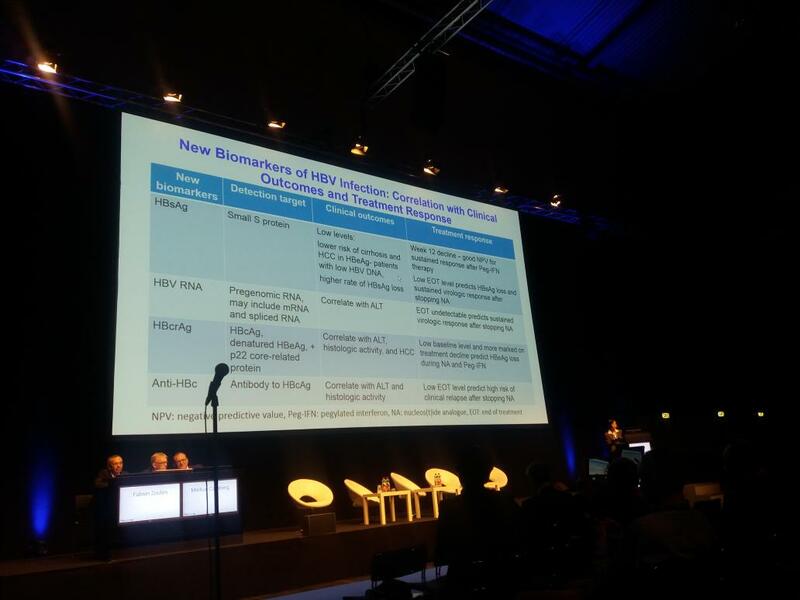 Here are her thoughts on the first ICE-HBV and European Association for the Study of the Liver (EASL) research Think Tank held at the Congress. Professor Anna Lok presenting current data on HBV cure endpoints. Hepatitis B cure is the next frontier in both liver disease and infectious diseases, and it is getting closer. Cautious optimism is allowed as many new drugs are entering the pipeline and investments are growing since the entry receptor for HBV was discovered in 2015. Still, many of these regimens might only induce remission as they might not eliminate viral cccDNA (covalently closed circular DNA – a special DNA structure that arises during the propagation of HBV in the cell nucleus and may remain permanently there). Almost 500 packed the auditorium for the Think Tank, with the main topics of discussion including endpoints of cure, novel biomarkers, current immunology and virology-based approaches for cure, and considerations for combination therapies. Professor Anna Lok (University of Michigan and ICE-HBV) gave a great summary of current data on HBV cure endpoints; Dr Barbara Testoni (Inserm Lyon and ICE-HBV) talked about how to impact cccDNA and Professor Mala Maini‘s talk (Imperial College London and ICE-HBV) focused on immunological strategies for HBV cure. Better in vitro and in vivo models are required to ensure that a cure is soon discovered. ICE-HBV is supporting this by collaborating with NIAID on a future reagent’s repository of HBV materials and an open access protocols dabatase soon available on www.ice-hbv.org. ICE-HBV will also hold a workshop on in-vivo models in Melbourne in October 2019, stay tuned! You can find out more on the next steps towards a cure in the “Global Scientific Strategy for an HBV Cure” released by ICE-HBV following a two-year in depth consultation process with key experts from the field, patient representatives and other stakeholders of the response to the hepatitis B epidemic.